I have been trying to get in touch with Jamie Romp, my Sound FX Designer for about two weeks now. He gave me a phone call today when I was in the studio. He told me several other animation students had asked him to do the sound design for them too but he has committed to mine then we had a good chat about the direction we want to take the project. Jamie has his own projects to take care of too and wants to get bulk of work done before Christmas and I don't blame him. We both agreed we would have the aniamatic and scratch track by mid- late November for him to polish come January. I also found it difficult to contact Ryan Jones, my Composer for about two weeks too. I have been chasing him up on Facebook and he called me today also. He has also been busy on several other projects and is committed. I feel like the sound team is solid and I have no doubt that they will do great work. I asked both Dave McDonald and Josh Bainbridge look at the work of John Klassen and come up with ways of recreating it in CGI. I want to be able to present some test renders for thursday as weel as next week to prove to Rosa, Kathy (and myself) that we can achieve something close to that style in CGI. 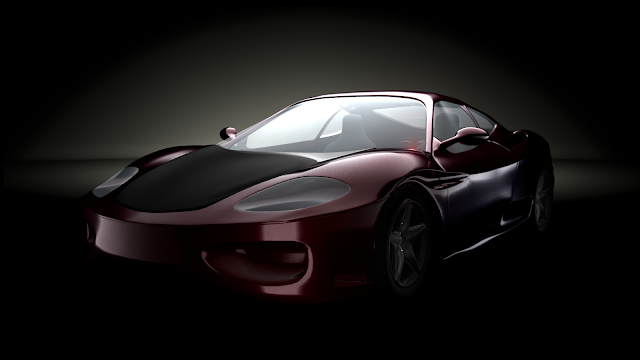 Today I also had a go at lighting a car in maya. I think I did a pretty good job. below is a render of the work so dar. Luckily Luke Jefferson, a recent graduate of your course, was passing by and gave me some tips on lighting workflow using mental ray's IPR to speed things up. My aim is to put it into a compositing reel. Below is a render of what I have so far I will finish it tomorrow.